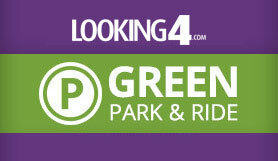 Looking4 Green Park & Ride is the closest car park to Luton Airport. It is significantly cheaper than Luton Airport’s short stay or mid stay and similar in distance and transfer time to Luton Airport’s Long Stay car park. Literally a couple of minutes transfer and you can see the runway and planes taking off from the back fence of the car park. Luton Airport Parking can be expensive throughout the year, but you can stop worrying about it and look no further than our very own exclusive Green Park & Ride product which is operated by Swift Airport Parking. This impressive 2000 space car park is highly secure with staff operating 24 hours, 7 days a week, and steel high perimeter fence, its reliable and secure. The location of this off-airport Luton Airport Parking facility is fantastic, its the closest park & ride to the airport and holds the Park Mark award. Transfers take just 2 to 3 minutes and shuttles run on demand 24/7 – you won’t find a park & ride any closer! What’s more, since the shuttles run on demand, you’ll not only get a better price, but you’ll save time compared to parking in the long stay. With 2000 spaces, this car parking option is fantastic value with great security. It’s totally enclosed by fencing with staff working 24 / 7. You simply park up in the arrival area, check-in with reception, hand over your keys and the courtesy transfer shuttle will be waiting to immediately transport you to the airport. On return, the shuttle bus will bring you back to the car park in minutes, where your car will be waiting for you in the returns area at the front of the car park. There’s no need to pay more when this great option is located so close to the airport at such a fantastic price! Excellent service & just 500 metres, the closest to Luton airport. This booking is Non-Flexible: Once booked this service cannot be cancelled, refunded or amended. You will need to leave your keys at reception as your car will be parked for you within the 2000 space parking complex. Vehicles up to the size of a transit van are accepted. Anything bigger than this may be turned away or charged extra for. On arrival at the access road to Looking4 Green Park & Ride, continue straight ahead to the car park. Our attendant will load your luggage allowing you to board our shuttle luggage free. After you have cleared customs, please call to request collection. The number will be provided on your confirmation email. As you drive into the Looking4Green Park & Ride Car Park, keep right and follow the road ahead.